You can never have enough toilet paper. Tom Coote set himself a target of going the whole distance of the ancient Silk Road by public transport in just nine weeks. Even one century ago this could have taken years. Even now one needs determination and fortitude and a very strong stomach - and that's just for the many scary toilets experienced on the way. Mixing history, local politics and daily dietary details (not to mention the ablutions again) Tom set himself a hard task. Scornful of backpackers in groups who just fly in and spray the view with their digital cameras - this is a book about a man determined to extract all the juice out of the hostel/backpack/lone-tourist-in-a-hurry experience. Whether waiting for visas to get into Tashkent or finding that your bus driver has disappeared with all your possessions (that seemed to happen often) or trying to smile even though there is a gun pointed at your head - this is dangerous travel for the reader. Tom has done all the hard work for you. You NEVER have to attempt this journey. All the essential and many non-essential details are here. Food you'd never want to eat, places you probably never want to go to and dictators you never want to live under - the Silk Road is like a knife through Asia. Starting in China at the Kunming border where you cross from Thailand Tom goes through Kazakhstan (where Borat remains famous) to Uzbekistan, Turkmenistan, Iran and onwards relentlessly to Turkey. The dry and often witty asides make the book really, that and the endless fly infested dunghills he has to squat over. We learn about the politics, the hopes and fears of locals and all the time on the TV are happy people marching under vast portraits of Dictators or awful MTV clones with dreadful local content. On the way you learn to haggle. In Bai Bazaar finding a bus to go to Ashgabat, for example, you discover you can catch a bus ride for 600 kilometres for just US$4 bucks. That's a steal, only stopping for Nescafé 3-in-1 in the middle of the Karakum Desert. In Ashgabat you will discover all the oil money has been wasted on monumental folly's, statues and the local needs for fresh clean water, education and justice are as neglected as ever. You learn it is relatively easy to get into Iran but lethal to get in a car. (People don't wear seat belts in case it insults the drivers skills!). Quite often Tom meets other travellers - young mostly, box ticking off countries and places - rather than engaging with the destinations at hand. I think that is the biggest disappointment Tom expresses - the lack of interplay between travellers and the places they are in. In Mashad we visit Haram-e Razavi - Imam Reza's Holy Shrine and all the while learn a little about Ghengis Khan who seems to have razed pretty much everything he ever came across as he went up the Silk Road. History is a tale of destruction I guess and nothing ever changes. No matter where Tom goes, from China to Turkey, he is always amazed at just how generous and helpful most people are to him and other travellers. Far from the general negative picture of things - he isn't always being ripped off and people go out of their way to point out places to stay or how to get from A to B (even if they don't know the way). It's one of the most positive things about Tearing Up the Silk Road - that in an age of paranoia about strangers and religion, everyone he meets tries to help. This volume is incredibly detailed, very well written and you are there with him, enjoying the historical asides and the present day frustrations of finding buses or customs or the sometimes very uncomfrtable lodgings or transportation. For any would-be armchair traveller of the Silk Road - this book is for you. Oddly enough - as I was reading this - I kept wanting to read the same book - but one written two thousand years ago. Now that would be something. 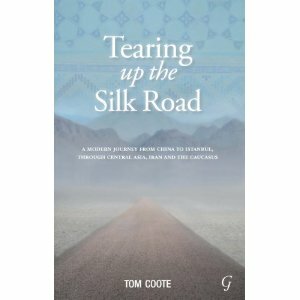 Until that crumbling diary is found in a tomb somewhere - Tom's Coote Silk Road will definitely suffice.